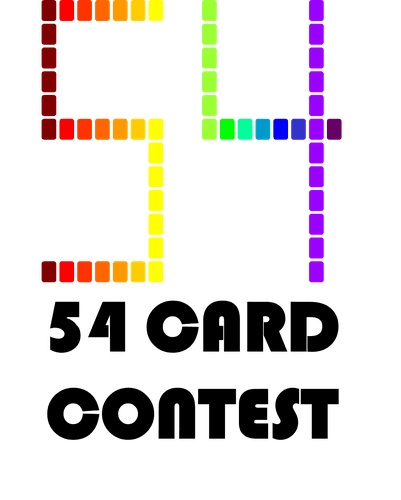 Welcome to the second annual 54-Card Game Design Contest! Side Room Games, is excited to sponsor this contest and find exciting new designs to get out to the gaming community. All contest information and game entries will be posted in this thread. I'll be keeping this top post updated so everything you need to know will be here. This is the earliest date that a game can be made available online and still be eligible for the contest. New games that are going to be entered in the contest may not be made available publicly for download on BGG or other websites prior to March 1, 2019. The purpose of this is prevent some designers from getting months or years of public feedback while others get much less. This also keeps the focus of the contest on new games rather than old designs. Games for the contest must be complete (Contest Ready) by May 31, 2019. Any game that is not Contest Ready by this date will not be eligible for the contest and will be removed from the entry list. No new games may be entered after this date. While last minute entries are allowed, I encourage you to use the full design period to allow more time for playtest feedback so that you create the best game possible. Votes will be accepted between the dates of June 15, 2019 and June 30, 2019. All votes are due by the Voting Deadline of June 30, 2019. No votes will accepted after this date. To be eligible for the contest, the games entered in this contest need to be new & unpublished. The game cannot have been entered in a previous contest. Games that were entered in other contests but not completed (i.e. Withdrawn or Incomplete Entries) are still eligible to be entered in this contest. No game entered in the contest may have an entry in the BGG database prior to the start of the contest. Designers are free to create a BGG entry later in the contest but may but may not have one earlier. To help keep the number of games manageable and playable within the voting time limits, there will be a restriction on the number of games entered. Each designer or team of designers is limited to one entry in the contest. Designers must be legally able to release their game, including the artwork. Artwork should be specifically designed for the game, public domain, or released under a Creative Commons license. When using Creative Commons artwork, please credit the original artist in your rules. Designers must receive permission from the rights holder to use artwork protected by copyright. Games violating copyright may be disqualified from the contest. There are no specific design qualifications for this contest. The game mechanics, theme, and amount of randomness are left to the discretion of the game designers. - Games are limited to 54 standard poker-size cards (2.5” x 3.5”) and both sides can be utilized as necessary. - PnP files should fit on A4/Letter size PDF sheets with 9 cards per sheet (so if utilizing both sides on all cards there would be 12 sheets max). - There are no restrictions on rules format or length. - No cutting, bending or mutilation of cards is allowed. * An image of the assembled game (more than one is fine but at least one is required). The image may be set up to replicate the game in play. * Links to the current game files. Rules and components should be in pdf format. The files can be hosted on your own web server or online storage sites such as Google Drive, Dropbox, Box, etc. The files must be freely available to anyone with the link and users should be able to download them without needing to create an account. All of the above information will be required in the entry thread. Any other info is at the designer's discretion. Please keep the first post in your WIP/Entry thread updated with links to the current game components and current information about the game. Please include the current status of your game in the Entry Thread's title. This will help other people know where you feel your game is in the design process. To enter a game in the contest, please post to this thread with a link to your WIP/Entry thread. The second post of the Contest Thread will contain a link to all games entered in the contest. To finalize your entry, you must make your game "Contest Ready" by posting to this thread. There will be a little over a month available for participants to play the games. No changes to the rules (other than minor typo correction) or components will be allowed during the voting period. When evaluating games, players may either print the games or use any electronic modules provided (such as Vassal or Tabletop Simulator). Tips to this thread: ??? The main prize pot will be divided up among the 1st, 2nd, and 3rd place winners using a 4:2:1 ratio. The prize pool for the other category prizes will be 50 geekgold from me plus any geekgold tipped to the category posts in this thread. (Immediately below this post.) Category prizes will be awarded to the 1st, 2nd, and 3rd place winners using a 4:2:1 ratio. A game can potentially win more than one category. For example, the winner of the Best Solo Game may also be the winner of Best Artwork. There will be a Jury Prize that the team at Side Room Games will select. The team will play every game that gets to contest ready and, at the designers request, will provide any feedback we have. Enter your game well before the contest deadline. This will give players plenty of time to play it and you will be able to make improvements based on their feedback. Designers should include version numbers or dates to all PNP files and keep track of the latest versions in your WIP thread. You might even keep a brief changelog there. Designers should check their WIP threads regularly after uploading new files and try to answer rules questions soon. If you know you won’t be available for some time, please leave a note. Vassal Mods and Tabletop Simulator Mods are allowed in this contest. Designers are free to create digital versions for their games but must provide PNP components as well. To be clear, building a digital version is optional and is not a requirement for entering the contest. Chris Hansen prepared a FAQ for users who are new to BGG but want to enter a game in the contest. Hopefully this will be helpful to get people up to speed so they can focus on their game design and not on learning BGG. Can I submit a design that utilizes artwork that I don't have any legal rights to? No, you must have legal rights to any artwork you use in the design. Can I have any counters/tokens to help keep track of victory points? No, 54 cards only. If the players need to keep score, suggesting pencil & paper is reasonable and allowed. Can I include a scorepad for final scoring? No official score sheet as an extra component, but having a detailed walkthrough of scoring in the rules so that someone can use a pencil & paper would make sense. Can we design a game where the cards would be laminated for writing & dry erasing? Not for this go around. Would be challenging for playtesters to put together and creeps beyond our publishing scope for the contest. But could be considered for future contests. Jazz Nights is the 54 cards jazz-themed card game, where you stack cards and make patterns to score points and to take tricks. Sets of icons will give additional points. Highest point total in a turn wins you the trick. Each player represents a political party, supporting different political views on three axes (nationalism/globalism, communitarianism/individualism, left/right). Each round represents an electoral term, with elections held between each round. After election, the party with most votes forms the government by inviting other willing parties to join in the government. The government needs to hold absolute majority of the given votes. The rest of the parties form the opposition. During the round, the government makes unanimous decisions on tax rate, social services, military funding, external policies etc., which affect the society and parties' popularity rates in different ways. The opposition can affect the public opinion, thus controlling how the government's decisions change each party's popularity. You are an airship captain on a planet where life is limited to a thin band of sky. You fly from rocky outcrop to skybase, scavenging crash sites and trading to stay afloat. The further you go in your journey, the more challenging the airscape becomes, but the higher the possible rewards. In order to survive you will have to reach a heavily guarded bunker, and gain entry by force. Colors have different symbolism and affect our subconscious and emotions. Each color carries its own energy and describes the world, choose your color and paint your game. This game is for 2, 3 or 4 players. The player in this game should do as many combinations of his color as possible and thus he score more points. The game has few rules and they are intuitive, making the game interesting and easy to learn. This game has 3 different game modes. Augeo is a game using a standard 54-Card deck. It is a bridge between trick taking games and climbing games. It is a trick-taking game in its core, but players can play more cards per trick as in climbing games. However, unlike climbing games, in Augeo players adds more cards one at a time in turn and they must follow suit. 2-3 bakers compete to fill orders to establish theirs as the best bakery in Sugar Town. To win, you will need to sell more baked goods than your opponents. Orders are determined by a combination of cards from the opponent to your right, as well as the backs of your own cards, which are revealed gradually. Bomb Raid is a 2-player trick-taking card game designed around military aircraft and anti-aircraft warfare. Each player represents an armed force seeking to destroy the enemy Targets while protecting their own. Targets are destroyed by Bombers, which have to get through Guns and Interceptors. In Card Race players use a standard deck to direct the path of the cards to a goal they have hidden from other players. A quick and simple game where alliances will be made and broken. "E tu?" is a 4 player game played in two partnerships. The goal is to make a strait of the same suit while preventing the other partnership from achieving this goal. Four nations have gone to battle, you must rise up within your nation as a commander, by gathering prestige cards to gain promotion. Battle opponent nations with your combat cards and lead your nation to victory. Fano is a combat card game that utilizes a fano plane to create an advanced "rock-paper-scissors" style of play. Achieve victory by strategically attacking, combining, and playing cards to counter and outmaneuver your opponent(s). Dungeon Solitaire – The Goblin King is a solitaire dungeon crawl that only uses two decks of regular poker sized cards. No dice, pen or paper is needs, just cards and this rule book. Miyav! (That’s how cats meow in Turkish) is a Fishing card game for 2-4 players (Four-player games are usually played in partnership; other numbers of players play for themselves) in which, cat breeders compete against each other by breeding the most kittens, preferably purebreds. In alternating turns, the players breed cats and put them in front of themselves making a stack. Each player tries to collect as many pairs as possible. Players are only able to see the topmost cat in their stack, so they must try to remember which cats they have already paired. At the end of the game, the player with the most points wins. The Nexus Motel is a special place, not just because it has free HBO, but because it is a rapidly fading stopover between this life…and whatever comes afterward. Five remaining ‘guests’ need your help to pass into the beyond before the Nexus itself fades away for good. Can you find enough spiritual energy hidden in the motel to check each of them out of their rooms, or are they doomed to fade away as well? Secret Agent is a deduction trick-taking game for 2-4 players using a standard deck of cards. In each round, one player will be the Boss, selecting the identity of the Secret Agent, while the other players will be opposing agencies. The Boss tries to make contact with the Secret Agent while protecting the Agent’s identity. The other players try to make contact of their own by deducing the identity of the Secret Agent. The player who gets the most Agents through to the Secret Agent wins! Sottobosco is a dexterity game with hints of strategy for 2 to 4 players. It is about little creatures, falling leaves and card castles. A play usually last between 30' or 45'. Players are little creatures from the woods, as Sottobosco means Underwoods. And winter is coming, so the creatures have to find food between the fallen leaves and build refuges to store it. It's time for your Spellweaving 101 finals! You and your fellow students stayed up all night cramming, but can you remember the words to cast a Really Impressive Spell first and complete your test? In 1572 the danish astronomer Tycho Brahe observed a new bright star in the sky near Cassiopeia: a explosion of Supernova. By playing with the elements, the players will discover how it is possible to create a Nova Star. The unlikely assassin is a solo game (1 player) which plays for 7-10mins. Your objective is to eliminate 3 main targets (criminals) using a sniper gun with a limited amount of bullets (card as bullets) and tyring not get killed in the process. The meadows are a riot of color, alive with the buzzing of insects, and it’s the best time to collect a beautiful summer bouquet. Can you gather the most stylish flowers? A card game of drafting and set collection for up to 6 players. Please tip this post to contribute to the Best Solo Game Category. Please tip this post to contribute to the Best Cooperative Game Category. Please tip this post to contribute to the Best 2-Player Game Category. Please tip this post to contribute to the Best War-Themed Game Category. Please tip this post to contribute to the Best Euro Game Category. Please tip this post to contribute to the Best Party Game Category. Please tip this post to contribute to the Best Artwork Game Category. Please tip this post to contribute to the Best Graphical Design Category. Please tip this post to contribute to the Best New Designer Game Category. Please tip this post to contribute to the Best Game Using a Standard 54-Card Deck Category. A great evil has been unleashed on the world. You and your fellow partigoers must correctly read the runes from the Necronomicon to send it back. However, if your misread, mispronounce, or forget then curses will build up preventing your group from winning. You mean I have to write rules for this thing I made??? As a really odd question here, I assume there's no possibility of a publishing contract with a standard playing card game? Or would said contract extend to a graphical overhaul of the cards to make it non-standard? Standard Poker Cards are not copyrighted. You can create a game and get it published to include a standard deck, and there are many examples of that. I would suggest going to any of those BGG pages and sending a query to the game creator to ask about their process. Disclaimer: I am not an attorney, so don't believe anything I have to say about laws! I'm just speaking from my own experience. Its a possibility! To take it to publishing it would likely require unique cards made with original art/graphic design. But there were a few games last year that we really debated on that were based on a standard deck. Just because I can... FIRST! I've done some playtesting with friends already at all three player counts, and the puzzle actually works! I'm excited to see where this game goes. Edit: As an update, the rules are up! Since the components are just a standard deck of cards, I guess that makes this Components Available . I also spiced up the summary EVER so slightly. Would a legacy card game, where the cards are marked on throughout the campaign, be allowed? The basic game would still be playable (just ignore the pen markings). Component rules say no bending, cutting, or mutilating (disfiguring) the cards, but also only cards (no pen). So I don't think so. What I do I think is that you really need to take the AR idea and run with it, Mike, just not in the context a design contest. I realize that creativity in a restricted design space is about pushing limits and boundaries, but this contest doesn't leave ambiguous boundaries: just cards, and no more than 54. Plain and simple. I'd rather not have a repeat of how the 9-card contest started with three weeks of people haggling over timers, toothpicks, card sleeves, phones, custom dice / tokens, rulers, etc, and what counts as a common household item. Checking off boxes on a on and mutilating are exclusively different to me. It's not easy to make a legacy card game if cards cannot be marked on. But I'll understand if that's the intent. I think I'll have to let Dustin make a decision before I move forward. It's not easy to make a legacy card game if cards cannot be marked on. Yeah for this year’s contest I’d say no to both marking & AR. But there were some unique ways people tracked info with just cards in last year’s contest. Deck of Many Dungeons did used layered cards to track stats/damage and Martian Colony used rotating cards to track resources. I’m sure there’s a way to make it work and I’m excited to see you try it! here is a odd question. I have a idea using the standard 54 poker deck for a game, I have checked books and so on to make sure that it hasn't been made. However, If I find out after posting the idea that it is a obscure game that I am unaware of, does this eliminate me making another game?